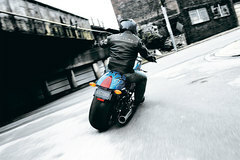 Modern American muscle inspires the 2010 Victory Hammer Motorcycle. Are you feeling the need? Then try this: a wide 250mm rear tire, 97 horsepower, 113 foot-pounds of torque, inverted front forks, dual-disk front brakes, a speedo and tach — standard. These performance features make such a strong statement that fully expresses the Hammer. For cruising on Main Street or cruising across state lines, the Hammer® provides a fantastic experience. Find out more about its features, specifications, pricing, comparisons, reviews, videos, images, brochures, downloads, and locate your nearest dealer that has the Victory Hammer Motorcycle.